“The organizers of Wikiconference USA 2014 have determined that based on a number of considerations, you are not invited to attend the conference. Your name has been removed from the list of registered attendees and will not be included on the list of attendees being provided to the venue. The banning of Kohs caught the attention of New York magazine Intelligencer reporter Jessica Pressler, who referred to it June 6 by saying Kohs was "allegedly" banned from attending. This upset supporters of Kohs who wrote on the "Talk" pages of Wikipedia that there was nothing "alleged" at all about the banning and WP was remiss in not reporting it in its regular pages since it was referenced in a "reliable source." 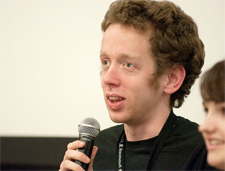 Arguing against allowing the Kohs incident to make it to the regular pages was Kevin Gorman, WP's first "Wikipedian-in-Residence at a U.S. university" (The University of California at Berkeley). Gorman helps students to be "more responsible and effective users" of WP. He is also working with the archives, libraries and museums of UC Berkeley to have their content released under a free license so it can be used in the WP Commons, the WP Foundation’s image, video and audio library. Kohs’ criticism of leaders of the event, while not named, could be unfair to them, Gorman further noted, raising the issue of WP:BLP (Biographies of Living People). WP policy is to be extra careful about damaging the reputations of living people. Several Wikipedians took issue with Gorman on the Talk page, saying refusal to report the boycott against Kohs “smacks of self-censorship and cover-up” (Alison). He said more than one “RS” should be required "or at least substantial overage in one good RS (and one line is not substantial").